Fully updated and revised, School-Based Play Therapy, Second Edition presents an A-to-Z guide for using play therapy in preschool and elementary school settings. 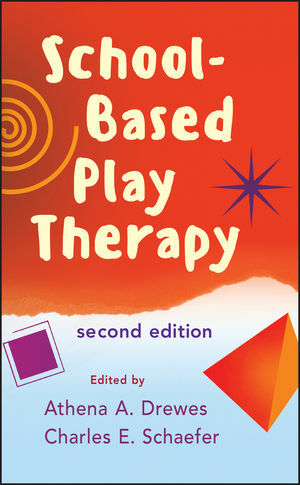 Coedited by noted experts in the field, Athena Drewes and Charles Schaefer, the Second Edition offers school counselors, psychologists, social workers, and teachers the latest techniques in developing creative approaches to utilize the therapeutic powers of play in schools. Filled with illustrative case studies and ready-to-use practical techniques and suggestions, School-Based Play Therapy, Second Edition is an essential resource for all mental health professionals working in schools. ATHENA A. DREWES, PsyD, MA, RPT-S, is Director of Clinical Training and the APA-Accredited Internship at Astor Services for Children & Families, a multiservice nonprofit agency in New York. She is a Registered Play Therapist Supervisor, past director of the Association for Play Therapy, and is on the editorial board of the International Journal of Play Therapy. CHARLES E. SCHAEFER, PhD, RPT-S, is Professor Emeritus of Psychology at Fairleigh Dickinson University in New Jersey. Dr. Schaefer is a renowned author, editor, and coeditor of over fifty play therapy books, as well as numerous journal articles and presentations on play therapy. He cofounded the Association for Play Therapy in 1982, which currently has over 5,500 members, and now serves as a Director Emeritus for the organization. Part I Play Therapy: Its Therapeutic Power and Research Effects. 1 The Therapeutic Powers of Play and Play Therapy (Charles E. Schaefer and Athena A. Drewes). 2 Meeting the Early Mental Health Needs of Children Through School-Based Play Therapy: A Review of Outcome Research (Sue C. Bratton ). Part II Implementing Play Therapy in the Schools. 3 Guidelines for Incorporating Play Therapy in the Schools (Kristi Perryman and Judy Doran). 4 Challenges and Barriers to Implementing Play Therapy in Schools (Dee Ray). 5 Using Play Therapy Assessment in an Elementary and Intermediate School Setting (Mary May Schmidt). 6 Transdisciplinary Play-based Assessment and Intervention in the Primary Years (Toni Linder and Brittney Bixby). Part IV Play-Based Prevention Programs with Paraprofessionals and Teachers. 7 Helping Preschool and Kindergarten Teachers Foster Play in the Classroom (Karen Stagnitti). 8 Primary Project: An Evidenced Based Approach (Mary Anne Peabody, Deborah Johnson, and A. Dirk Hightower). 9 Child Teacher Relationship Training: Using the Power of the Child-Teacher Relationship as a School-Based Mental Health Intervention (Mary Morrison and Wendy Pretz Helker). 10 Treating Disruptive Classroom Behaviors of Preschoolers Through Teacher-Child Interaction Therapy (David McIntosh). Part V Individual and Group Play Therapy Approaches. 11 LEGO®-Based Play Therapy for Autistic Spectrum Children (Daniel LeGoff, G.W. Krauss, and Sarah Allen Levin). 12 Trauma-Focused Group Play Therapy in the Schools (Yih-Jiun Shen). 13 Group Sandplay in Elementary Schools (Theresa Kestly). 14 Play Therapy for Anger Management in the Schools (Barbara Fischetti). 15 Group Play Interventions for Children with Attention Deficit/Hyperactivity Disorder (Linda Reddy). Part VI Special Populations and Special Issues. 16 Play Therapy for Children of Alcoholics (Laura Jacobus-Kantor and James G. Emshoff). 17 Understanding and Generalizing Communication Patterns in Children with Selective Mutism (Laurie Zelinger). 18 Play, Create, Express, Understand: Bereavement Groups in Schools (Ruthellen Griffin). 19 Redrawing the Front Line: A Play Therapy Service for Meeting the Psychosocial Needs of Children and Families in School (Geraldine Thomas). 20 The Nana’s Model: School-Based Play Therapy with Children who are Homeless or Severely Impoverished (Ana Sutton). 21 Better Playtimes: A School-Based Therapeutic Play Intervention for Staff and Children (Alison Woolf).